What does it mean to be impatient? It is when you are restless, nervous, or wanting to get things done in a hurry. Do you know someone who is impatient? That person may not want to wait for things. Priscilla is a field mouse who was impatient. She was always scurrying around, never finishing projects. She was always in a hurry. Other mice got tired just watching her scurry and twirl around looking for another project to start before the present one was completed. She ran here and there and everywhere, never finishing anything. Priscilla didn’t have many friends because she never had time for them. One of her friends, Millie, loved her anyway and got used to Priscilla’s ways. However, she did wonder what it would be like to finish a conversation with Priscilla and a have complete meal with her. Priscilla never finished her meal because she was impatient to get to the next chore. She didn’t finish conversations because she interrupted others and even herself. Her place was a mess! There were half cleaned rooms, a half made bed, and remnants of half eaten food all over the place. Her fur was a mess and her claws needed cleaning and filing. Her tail would get tangled in a knot because she would turn and spin sharply, going one way then the other, to the next task. She would wonder later how that happened and sometimes take the time to untie it. One day, she was helping load a pile of food for the winter when she turned too quickly and knocked the whole pile over! Another time, she ran and grabbed some cotton she would use to fluff up her bed. She turned, thinking it was dinner time, and stuffed it into her mouth! She choked and took it out of her mouth, then set it down and forgot to go put it on her bed. Wow, what a mess she was! Would you put cotton in your mouth thinking it was food? I bet not! Once, a terrible thing happened that brought Priscilla to a halt! 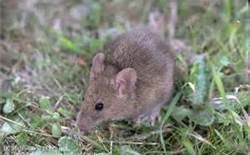 She was scurrying around on a rocky hillside, picking up seeds that had blown off the trees. All of a sudden, she could not move! Her tail was stuck! In her hurrying around she had dislodged some rocks, causing them to fall onto other rocks, knocking them against others which came crashing down on her tail. She pulled and pulled but couldn’t get free! She didn’t think she had the time for this. There was too much to do! She tried again but still could not get free! She called for help. Where is everyone? Why aren’t they here to help me? She thought. “Stop gawking and help me out!” She yelled. They both pulled but stopped when they realized all the rocks could come crashing down on them and then continue down the hill on top of all their burrows. “Hurry! Go get help! Hurry up! Go! Skippy said, “Don’t yell. I’m going! Skippy was going as fast as he knew how, but to Priscilla, he was just moseying around. Soon all the mice came to investigate the problem. Millie came to wait with Priscilla while the others planned the course of action that was needed. They had to move the rocks from up above before they could move the ones holding her tail. “Oh, this will take a lifetime.” moaned Priscilla. They started on the rocks at the top. Pulling and shoving them, they painstakingly moved one rock at a time. It became apparent, even to Priscilla, that they needed to take their time. Cautiously they moved the rocks. They didn’t want to dislodge the rocks, causing an avalanche to cascade down and squish Priscilla, Millie, and their homes. Priscilla told Millie to leave so she wouldn’t get squished in case they began an avalanche. Millie said she would not leave her friend. Priscilla really looked at her friend for the first time and noticed she was a kind and patient mouse. 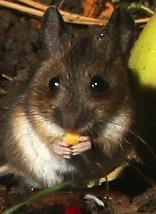 Mice have poor eyesight, so when it got dark they had to stop working. Millie stayed with Priscilla all through the night. She told her stories, and when Priscilla finally slept, Millie cuddled close to keep her warm. The next day proved tiresome as well. They worked and worked moving one rock at a time. The mice worked in groups. Some moved rocks and others brought food. They took turns resting and working. Some came by Priscilla to offer words of encouragement or tell her the status of the work. Some came to lighten her spirits with a joke. They were all trying to ease her worry. Skippy rolled over an apple he had found. She and Millie gladly accepted it, and the three of them ate it all. She smiled with contentment after it was gone. She had never finished a whole meal before and had not known how satisfying it was. Priscilla was learning so many things about her neighbors, and she was making new friends. She didn’t know mice could be so interesting. She began to relax, smiling. Millie laughed and said, “Priscilla you scurry around so fast you twisted yourself into a knot!” I’ve seen it before! Priscilla took life more slowly and learned it was better to be patient rather than impatient with life and other mice. Boys and girls, are you impatient? Do you try to do things too fast? Some jobs can be done quickly, but some need to be done slowly and completely. When you are doing your chores, make sure you do a complete job. Turn around and look at your bed when you have made it and see if it is a good job or just half made. When you clean up your toys, make sure they are all put away. Sometimes toys hide under beds. Look to see if there are any there. Take pride in your work. Do your chores and homework completely. We, your parents and I, will be so proud of you! This story reminds me of a song I heard long ago when my children were small. Here is a link to it, but before you click it, ask your parents if you can listen to it. It came out in the 80’s. It is from the album Time Machine and is called Be Patient. Click here to listen to it. Memorize: Galatians 5:22-23 But the fruit of the Spirit is love, joy, peace, longsuffering, kindness, goodness, faithfulness, gentleness, self-control. Against such there is no law. Longsuffering also means patience. The English Standard Version says: But the fruit of the Spirit is love, joy, peace, patience, kindness, goodness, faithfulness, gentleness, self-control; against such things there is no law.